Helen and Gemma approach Eddie in the kitchen to see if he is OK. Eddie dismisses their concern and tells them that they shouldn't be in the kitchen. 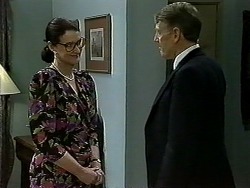 As Helen presses for further information Eddie informs them that a close friend in England is sick. Gemma says he should go to visit but Eddie doesn't want their help. Dorothy is going on another date tonight. RYAN: The neighbours will call you a man eater. DOROTHY: That's better than the Old Burke! Ryan is off to do some work for Joe's business and Dorothy says her dates are none of her friend's business. DOROTHY: Ladies don't have little black books….they're pink! Chrissie and Paul discuss the gift shop, Paul compliments Chrissie on the work she has done. Isabella enters; she has been shopping for her family but has also bought a present for Paul. CHRISSIE: It's easy to be generous with other people's money! Isabella then presents a shocked Chrissie with a present; Isabella says she wants to be friends. Gemma and Matt discuss that Harold is struggling to get over Kerry. As they decide how they can make use of an empty house Gemma brings up Eddie's phone call, they think he was lying. Matt goes back to work they arrange to have a moonlit picnic later. Chrissie asks Dorothy about Argentina and the poverty, Chrissie wants to know how desperate people are there and Dorothy tells her that people will do anything. Jim and Helen arrive; Helen goes into the kitchen where Eddie is crying. He tries to blame the onions but Helen doesn't believe him. 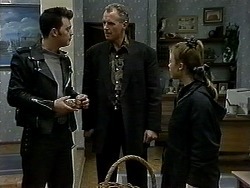 Eddie reveals that it's his Dad that is ill, he's had a near fatal heart attack, and Eddie won't go to see him because they fell out years ago. EDDIE: I'd hate him to die without making up. 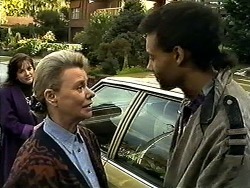 Eddie doesn't want to leave because of Harold but Helen says he must go home. It's raining so Gemma and Matt are having a picnic inside, they like having an empty house but Eddie returns home with Helen. They've found a replacement at The Waterhole for him, he's going home tomorrow. Helen says Gemma must work at the shop and live with her until Harold returns. Matt isn't pleased about the new living arrangements. Dorothy arrives to meet her date (Geoffrey). He tells her that she looks like his ex-wife! He then continues to go on about his ex-wife and doesn't let Dorothy say anything. Geoffrey is still going on about his ex-wife and Dorothy is becoming irritated. As he carries on Dorothy says that he is clearly looking for a copy of his ex-wife and that isn't her. Geoffrey decides not to mention her again. Matt and Gemma sneak in to have their picnic thinking that the house is empty but Jim is here! They have their picnic but Jim is staying in, Matt is fed up of never being alone with Gemma. As the rain pours down Matt and Gemma cuddle underneath the veranda. Gemma discusses how everything is changing but she still feels the same. Matt says being with Gemma feels right and they kiss. 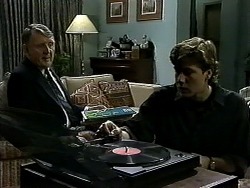 Ryan is listening to music as Dorothy and Geoffrey arrive home; Dorothy goes to make coffee as she asks Geoffrey to put some music on. Ryan goes to bed as Geoffrey listens to the music, Dorothy enters and Geoffrey reveals his ex-wife left him for another man. GEOFFREY: I'm more in love with her now than I ever was. DOROTHY: He's haunted by his ex-wife. DOROTHY: Yes, she's not even dead. Isabella comes down the stairs crying, Paul follows her down, she tells Paul she isn't sure how she can live without him. In the driveway, Jim loads Eddie's cases into the car, Eddie says goodbye to Chrissie, Helen and Gemma. Jim drives Eddie to the airport as the three ladies wave goodbye. Isabella is making breakfast as Paul comes down to molest her, Chrissie returns; she is upset about Eddie leaving. As she sits down Paul announces that he and Isabella are engaged, Chrissie looks stunned!